Lānaʻi’s Uncle Allen Kaiaokamalie has dedicated much of his life to teaching young people of his community about land and ocean resources and how to mālama (care for) them. 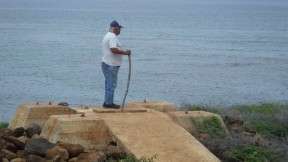 He remembers a time when fish and limu were abundant on the Maunalei shoreline and is saddened younger members of his community can’t fish and gather limu as he once did. The realization that limu abundance is key to fish abundance he started the Lānaʻi Limu Restoration Project (Project) to plant limu along the Maunalei ahupuaʻa (traditional land division) shoreline. 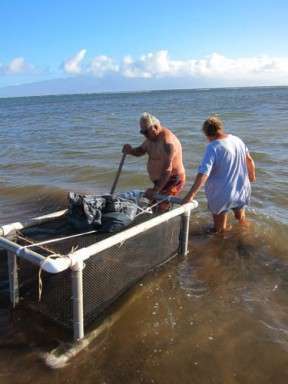 First the Project attempted to cultivate limu in floating cages just off Maunalei’s shoreline. Growing limu in this manner increases the amount of limu that can be used for outplanting. The limu growing effort met with mixed success. Predators in the form of honu (sea turtles) and the two legged kind (man) proved to be an obstacle. In order to protect limu from predators Project developed a proposal/plan to grow limu in aquaculture tanks and then outplant it along the shoreline. Pūlama Lānaʻi (the majority landowner’s company charged with management of his Lānaʻi properties) was presented with this proposal and readily accepted it and indicated it would support the development of the infrastructure for the aquaculture system (digging a well to help salt-water transfer to land based tanks etc). The Project’s limu growing plans were put on hold pending proper permits to dig a well. After almost two years of waiting, Uncle Allen, with the support of his friend Robin Kaye and high school teacher, Dr. Lisa Galloway, decided to move ahead on their own. The Project recently renewed limu cultivation efforts thanks to a recent NOAA grant. A new and improved floating cage was set out a couple of weeks ago. Three aquaculture tanks have just been delivered and the aquaculture system is scheduled to be installed soon. 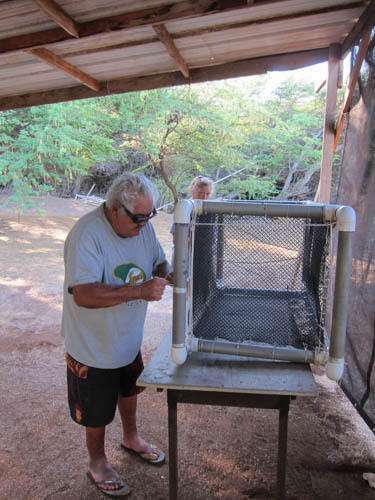 This Project combines Uncle Allen’s passions to restore limu and fish abundance and to pass on his traditional ecological knowledge to the youth of Lānaʻi. Mahalo Uncle Allen for caring about both. Uncle Allen working on the floating limu cage. Photo by Robin Kaye. Putting the cage Into the ocean. Photo by Robin Kaye. Ho’omaika’i loa, Anakala Allen, Robin Kaye and Dr. Lisa Galloway, such a great benefit to everyone in your community ‘ohana!!!! Alright Anakala Allen what a beautiful successful project in the replanting of limu for the challenge can be very difficult when dealing with our community and the two legged invasion species. Your consistent will has payed off Anakala Allen. Great Job done.